? ?Well, I'm back. I've been back since last week, actually. 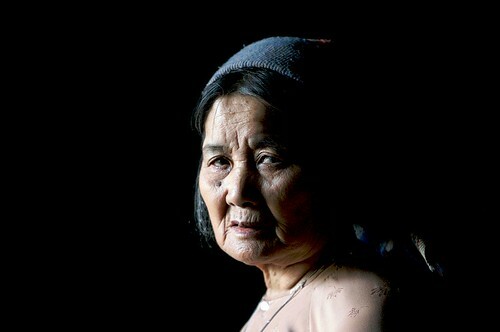 This is a photo of my grandmother. I think it's my favorite of all the portrait photos I've ever taken of anyone. It's also something I'd never be able to replicate, because my grandmother is notoriously difficult to photograph, because she hates having her picture taken.I was walking by the kitchen (it's separate from the house) and looked in the window, and she was talking to my aunt. The only light on her was coming from the door in which my aunt was standing... it was diffused sunlight (cloudy day)... so I quietly ran and grabbed my camera and shot it right through the bars in the windows just as she turned in my direction.I have lots of photos to post, I've put up a dozen or so on Flickr and will be posting dozens more... some of which I am really happy with. I also have about 9 hours of video to capture and look through... and hopefully post to Videonatomy.